Poland, a country in Central Europe bordered by Germany, Czech Republic, Slovakia, Ukraine, Belarus, Lithuania, the Russian exclave of Kaliningrad, and the Baltic Sea has a total land area of 120,696 square miles and a population of around 38.2 million. Since the end of the communist era, Poland has attained very high standard of living and its economy is classified as high-income economy. By adhering to a liberalizing policy, it transitioned from a centrally planned economy to a market-based economy. In fact, it successfully held at bay the global recession, which had plagued many of its neighbors, from affecting it. The sectors of its economy are manufacturing (automobiles), pharmaceuticals, agriculture, garments, glass, pottery, tourism etc. The best time to visit Poland is mid-April through October with June, July and August being the peak season. As the country has preserved its cultural wealth despite the upheavals it went through, it is a popular tourist destination. Its topography, cities, architecture, history, culture, landscape parks, and nightlife further adds to its charm. It has more than a dozen World Heritage Sites to its credit. 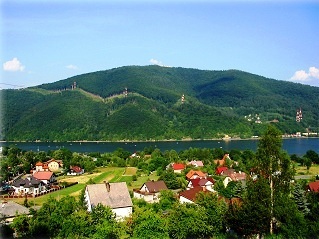 The Gorce National Park, Bieszczady Mountains, Slowinski Natinal Park, Masurian Lake District, Warsaw, Krakow etc., are among the popular destinations. Poland Eyewitness Travel Guide 978-0756661304 $17 The best tourist guide to Poland! Covers Restaurant and Hotel Reviews, Maps, National Parks, History, Sights, and Culture. Photos are a standout. Cracow Eyewitness Travel Guide 978-0756660345 $19 A 50-page traveler’s introduction to the city followed by area-wise sections. There are also sections on Guided Walks and Traveler’s needs. Krakow and Poland Travel Map by Globetrotter 978-1847732095 $9 1:900,000 Scale. The first stamp of Poland was a stamp issued in 1860 in the Coat of Arms theme. The stamp features a blue and rose combination. There are a few varieties and an imperforate version in different color combination. The stamps (Scott #1a-d) are rare and catalog in the $1000 range for mint and upwards of $200 for used. The stamps were replaced by issues of Russia from 1865 onwards. During the German occupation during World War I, a number of Polish cities issued stamps with ‘Poczta Polska’ overprints with the design showing the name of the city as an inscription. The sets issued in Warsaw, Cracow, and Posen are all very collectible and catalog in the tens of dollar range. Counterfeits are common as well. The most valuable set during the period is a Cracow Issue which were Austrian Stamps from 1916 to 1918 overprinted ‘Poczta Polska’ released on January 17, 1919. Most of the stamps in the set (Scott #41 to #55) catalog for upwards of $100 and the highest denominations catalog in the thousands of dollar range. Poland issued a set of twelve stamps on January 27, 1919 in the Polish Unity theme . The set (Scott #81 to #92) catalogs for around $50 mint and around $30 used. A variety of the same set with a few additional denominations (Scott #93 to #108) were issued between 1919 and 1920 and that set is relatively inexpensive cataloging for around $7 mint and around $5 used. A third variety issued for use in Southern Poland (Scott #109 to #120) catalogs for around $40 mint and around half that for used. A set of eleven stamps released between 1925 and 1927 in the Polish History theme. The set (Scott #227 to #237) catalogs for around $40 mint and around $3 used. The designs show Holy Gate of Wilno, Poznan Town Hall, Sigismund Monument in Warsaw, Wawel Castle at Cracow, Sobieski Statue at Lwow, and Ship of State. A redrawn version of part of the set was released between 1926 and 1927 and that set (Scott #238 to #241) is also very collectible cataloging for around $20 mint and around a dollar for used. A set of three stamps released on September 7, 1944 to mark the establishment of the Polish Peoples Republic. The set (Scott #341 to #343) catalogs for around $120 mint and around $145 used. The designs show Romuald Traugutt, Tadeusz Kosciuszko, and Jan Henryk Dabrowski. A surcharged overprint of part of the same set (Scott #362 to #363) was released in 1945 and that set catalogs for around $35 mint and around $40 used. Starting in the early 1950s, Poland started issuing large quantities of cancelled-to-order (CTOs) stamps and that practice continued through the early 1990s. Those stamps are not especially valuable and have very limited interest among collectors. A set of twelve stamps released in 1960 showing Birds in Natural Colors. The set (Scott #935 to #946) catalogs for around $20 MNH. CTOs are valued in the $5 range while postally used copies are valued in the same range as MNH. The designs show great bustard, raven, great cormorant, black stork, eagle owl, white-tailed sea eagle, golden eagle, short-toed eagle, rock thrush, European kingfisher, wall creeper, and European roller. A set of six stamps released in 1997 showing Polish Country Estates. The set (Scott #3344 to #3349) catalogs for around $11 MNH and around $9 used. The designs show Lopusznej, Zyrzyna, Ozarowie, Tulowicach, Kuznocinie, and Koszutach. The first coins of Poland were Copper Coins from around the 10th century AD. In the modern era, Grand Duchy of Warszawa Standard Coinage (1 Solidus = 1 Schilling, 3 Dolidi = 2 Poltura = 1 Grosz, 3 Poltura – 1.5 Grosze – 1 Polturak, etc) Copper Grosz Coins issued in 1810. The first issues have mintage but still catalogs upwards of $10 for XF. German Occupation Regency Coinage (100 Fenigow = 1 Marka) was introduced in 1917 with the issue Iron Fenigows with high mintage (10s of Millions). They can be had for a few dollars in UNC. Republic Standard Coinage (100 Groszy = 1 Zloty) debut in 1923 with the introduction of a Brass Grosz coin showing a crowned eagle with wings open in Obverse and Value in Obverse. The issue is rare and catalogs for around $200 in UNC. Gold Coins were issued as early as 1812 when a 0.1109 troy ounce trade gold coin appeared. Since then, a number of gold coins were released over the years and they trade at a good premium over bullion value. Coins $1 and up Common Grosz and Zloytch UNCs from the 1940s onward starts around $1. 2010 World Expo Silver Commemoratives, Early 20th century UNCs, Coins from the 1970s and prior dates that are graded MS62 or higher, etc starts around $10. Recent Commemorative Silver Proofs, 16th Century Sigismund Era Coins in High Grades (VF+), etc starts around $50. Low Mintage Commemorative Silver Proofs from the 1970s onward, Gold Coins and Proofs, etc go well into the 100s. Paper Money $1 and up Common UNC Banknotes starts around $1. Large Rubels from the 1910s in XF, Recent High Values in UNC, etc starts around $10. Specimen Banknotes in UNC from the 1970s onward, Inflation Issues from the 1920s in high grades (XF+), etc start around $30. WZOR Specimens from the 1960s and prior dates in UNC, UNC Bundles, Complete Year Sets, etc go well into the 100s. Amber jewelry, wooden carvings, embroidery, painted dishes, and flavored vodka are some of the souvenirs visitors take away from the country. Militaria $5 and up Flight Squadron Address Labels, Medals, and Plaques start around $5. Eagle Badges, Orders and Crosses, etc start around $25. WW Valor Medals, Crosses Air Force Regiment Badges, etc go into the 100s. Pottery and Glass $10 and up Boleslawiec Stoneware Contemporary Pottery start around $10, go well into the 20s and 30s for Bowls and Jars, and go into the $100 range for exquisite vases and platters. Jozefina Table Vases, Art Glass Pieces, etc go well into the 100s. Antiques $5 and up 19th century maps start around $5. Vintage Wood Jewelry Boxes, Chodziez cups etc start around $25. Handcarved Figurines, Jupiter Kerosene Lanterns, Rogalska Art Plate Bowls etc start in the 50s. Exquisite Vintage Porcelain Figurines, Victorian Costume Vests, Silver Candlesticks etc go into the 100s. Art $10 and up Historically relevant 19th century photographs start around $10. Vintage Travel Posters, Racinet Costume Prints etc start around $25. Signed Wood Carvings, Vintage Wood Inlay Art, etc start around $50. Original works by Lionel Reiss, Leszek Piasecki, Maciej Lachur etc start in the 100s.